Silicon based solar cell device manufacturing is based on photovoltaic (PV) Si feedstock of upgraded metallurgical-grade silicon with at least 6N purity. The quality control of the Si purification process is mandatory to ensure high yield manufacturing. The CAMECA IMS 7f-Auto provides quantitative measurement of the trace element impurity concentration in PV Si feedstock with detection limits from the ppm down to the ppb range, depending on the species to be analyzed. SIMS detection limits in silicon for 15ng of analyzed material are shown on the below table. The performance of the CAMECA IMS 7f-Auto is particularly attractive for the analysis of light elements (H, C, O, N), main Si dopants (B, P, As), as well as metals (Al, Cr, Fe, Ni, Cu, …). Opposite to TOF-SIMS, the detection limits of the IMS 7f-Auto are improved when increasiong the profiling speed. The lowest detection limits are achieved for light elements, thanks to optimized Ultra High Vacuum conditions obtained by combining titanium sublimation with turbomolecular pumping in the analysis chamber. 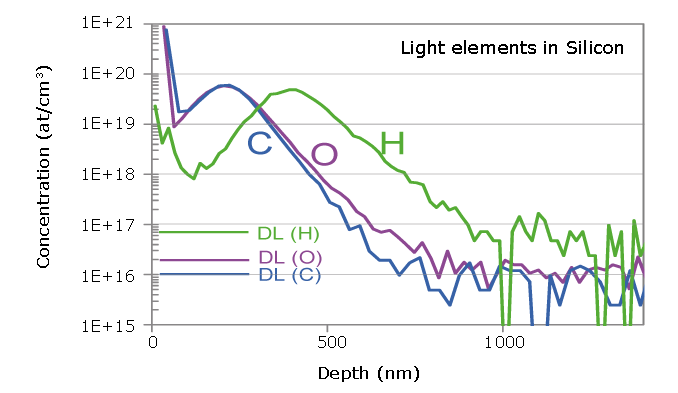 The top page graph demonstrates excellent detection limits for oxygen in silicon. PV Si can be analyzed in its original physical form with fast and easy sample preparation on the IMS 7f-Auto. Typical throughput is 4-6 analyses per hour. The tool can be equipped with an automated storage chamber with up to 6 sample holders, thus ensuring even higher throughput. For further details, you may request the publication: SIMS analytical technique for PV applications. P. Peres et al. Surface and Interface Analysis, n/a. doi: 10.1002/sia.3525. This paper presents analytical performances provided by SIMS tools for the development and manufacture of new solar cells with results for two main applications: trace element analysis in PV Si feedstock, indepth distribution of main components and trace elements in CIGS thin films.